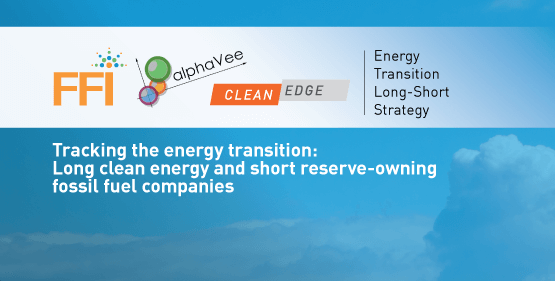 Index providers FFI, Clean Edge, and Alpha Vee Solutions have teamed up to create the Energy Transition Long-Short Strategy, a rules-based alternative index strategy designed to benchmark and capture the potential upside of a transition to a low-carbon economy. This thematic, long-term strategy is long clean energy and short reserve-owning fossil fuel companies. The long portfolio is comprised of 40 companies selected from the Clean Edge universe of more than 100 clean energy, advanced transportation, and grid companies using fundamental quality factors. The 20 fossil fuel companies comprising the short portfolio are selected from FFI's Carbon Underground 200™ list using metrics that measure a company’s exposure to stranded asset risk. Long and short positions are adjusted dynamically using Alpha Vee’s proprietary quality, value, and momentum factors. The net long exposure ranges from 40% to 100% with the short position comprising 20% or 30% depending on the momentum indicator. The strategy is reconstituted every six months and rebalanced quarterly.